Put more prospects on your plate. Learn more. Sell more. Grow! anticipating, inspiring and capitalizing on trends and tastes in all food service sectors — give Kallman a call. We’ll put more prospects on your plate. 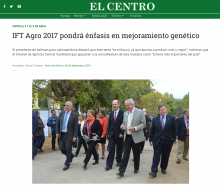 The centerpiece of our agriculture portfolio is the IFT-AGRO Conference and Exhibition, part of the IFT “International Fair of Technologies” series of events we launched in 2012 to address pressing industrial issues in Latin America, where we’ve operated since 1993. Our LATAM headquarters office is based in Santiago, Chile, adjacent to the U.S. Regional Trade Center, which we founded in 2015, and currently own and operate. 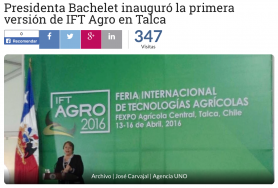 The inaugural IFT-AGRO 2016 was held on an 8,000 sqm site in Talca, the hub of the country’s fertile Maule farming region. 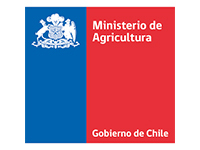 The event attracted nearly 5,000 trade visitors and almost 100 exhibitors — an unqualified success for a first time show — thanks to the significant support of public and private sector advocates, including Agricola Centrale, Chile’s leading farm and food advocate, and the participation of the country’s President Michelle Bachelet, who presided over the official opening. 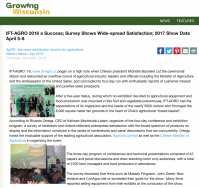 The show also hosted 37 conference and professional education sessions that were attended by some 1,500 farmers and affiliated producers and distributors. With trends in genetics, smart farming and the participation of universities and academic leaders driving market interest and growth, IFT-AGRO 2019 is forecast to double in size over the 2018 event. It’s the nature of the business: plant a seed and watch it grow.